Like many women reading this article, my closet is full—literally bursting—with clothes, and yet I often stare at the haphazard rows of tops and bottoms feeling there is nothing I want to wear. My wardrobe is a chaotic mishmash of styles gleaned from malls and thrift stores—pieces thatseemed like a good idea at the time of purchase, but failed to deliver once placed amongst my growing hoard. My problem is common one. In fact, the average women buys half her body weight—63 pounds—in clothing each year, and we wear those pieces, on average, only seven times before getting rid of them. And we get rid of a lot. Aside from what is donated to thrift stores, the average North American throws away at least 70 pounds of clothing each year, and as a result, textiles account for five per cent of municipal waste. Eighty billion pieces of clothing are purchased worldwide each year, which is 400 per cent more than a decade ago. Women have four times as many clothes in their wardrobe as they did in 1990, and a large proportion of those wardrobes—22 articles, on average—have never even been worn. When we include clothing for children and men, it adds up to an astonishing 150 billion new clothing items made annually. These statistics are attributed to the rise of “fast fashion”, where consumers can buy cut-price versions of more expensive designer looks. You’ve probably seen some of these low priced articles—those $2 T-shirts, those $5 button downs, or that $10 dress. You might even be wondering what the problem is. I mean, if clothing is cheaper, isn’t that a good thing? Unfortunately, it’s not as simple as that. The problem is that there is always an inherent cost attributed to any item. When the consumer doesn’t pay the full cost for an item, for example, if the item is super cheap, then someone somewhere else pays the remainder of the cost. In the example of the clothing industry, the people who bear the brunt of the cost are the ones who make the clothing. For example, workers in Bangladesh, where 80 per cent of the country’s exports are apparel, currently earn the lowest minimum wage in the world, taking home about $43 a month. Chinese factory workers make slightly more—$117 to $147 a month. The garment makers sometimes pay the cost with their lives. Three out of four of the worst garment factory disasters in history happened in 2012 and 2013. The deadliest garment factory accident in history occurred in 2012 at the Rana Plaza apparel factory in Bangladesh. On that day more than 1,000 workers lost their lives and another 2,500 were injured when the building collapsed. It was a wake-up call to the fashion industry and it sparked a global movement to improve the working conditions for those in the clothing manufacturing industry. For example, wages in Bangladesh were lifted from $38 a month to $68 a month for the entire country in 2013—but 40 per cent of companies have not followed the law. At issue is the fashion industry’s growing dependence on a business model that encourages some fashion chains to push for the lowest prices from subcontracted factories in countries that already have some of the leanest production costs in the world. To keep their contracts, factories are forced to pay their workers less and less—where they put concerns about production schedules before those of worker rights or safety. The environment also pays part of the cost. The clothing industry is the second largest polluting industry, just behind the oil industry. Ten per cent of the world’s total carbon footprint comes from the clothing industry (as a comparison, the entire aviation industry is only two per cent). It seems clear that we can’t continue to shop the way we do, but what is the solution? Destanne Lundquist is a local business woman who is well aware of the problems surrounding the fashion industry. Lundquist is also the sole proprietor of Moss Grey, a clothing company based from her studio in Cumberland. In her eclectic yet efficient space, where walls are lined with books and papered with patterns, and where stacks of beautiful fabrics lie in wait, Lundquist is crafting beautiful, long-lasting and well-made garments from natural materials—and she is hoping to adjust our attitude about how we clothe ourselves, one garment at a time. For as long as Lundquist can remember she has been infatuated with fabric and the act of creating unique pieces of clothing. 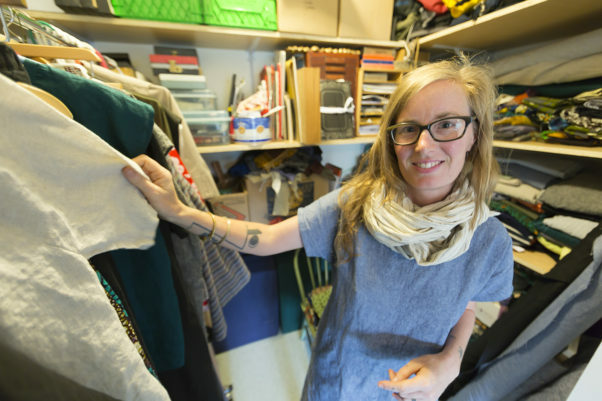 “I’ve been modifying clothes since I could hold scissors,” she says. “I suppose I’ve always had a compulsion to sew my own clothes. Not from scratch, though. Actually, I liked to amend clothing I found in thrift stores. I didn’t want to wear generic clothes. I wanted to wear artistry. Besides, the clothes off the racks never looked good on me. 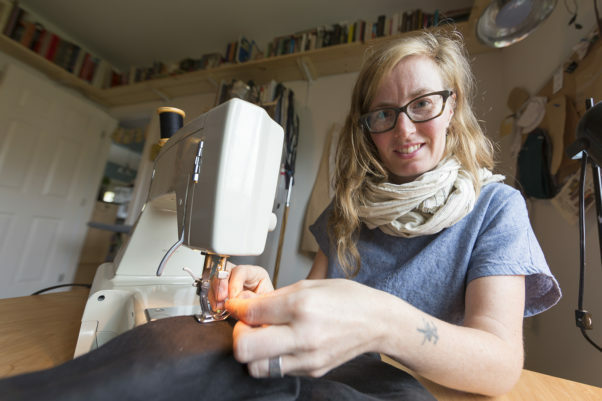 Though Lundquist isn’t new to the craft of sewing, she is relatively new to using a sewing machine and using patterns. “All those years growing up I’d sew my clothes by hand as I didn’t know how to use a sewing machine. I sewed my first garment on a sewing machine—an easy Japanese styled dress—in 2013. It was also the first time I’d used a pattern. Actually, I was very intimidated by patterns, but you have to start somewhere, right? I suppose I took an unorthodox approach to learning to sew—being self-taught, for example. But it cultivated internal confidence. It was sort of like learning to play an instrument—you know it’s not going to sound awesome in the beginning!” she says with a laugh. Lundquist designs and sews all of her pieces by hand. “No one else is involved at this point. I’m a one woman show right now,” she says. Lundquist works with only natural fabrics such as hemp and cotton blends, but she is particularly enamored with linen. “I absolutely love linen. Linen makes me feel comfortable—and there is something about the vibration of the fabric. I love the way it sounds and I love the way it feels on my skin. It’s a very honest fabric. “Linen also ages beautifully,” she adds. “It has the ability to last because it has innate strength. Linen dries quickly and is resistant to mold, mildew and moths. It’s anti-microbial, it wicks moisture and it doesn’t hold on to odors. As a result, you don’t have to wash it as often. Linen is the perfect travelling fabric. Staring at a closet full of clothes and deciding what to get rid of can be a daunting task. Where do you start? What stays and what goes? Lundquist understands and will come to your house to help you purge the clothes that don’t fit anymore, those that aren’t flattering, or simply don’t suit you anymore. Admittedly, it’s difficult to purchase a $50 tank top when you can get one at Walmart for the price of a cup of coffee. The thing to remember is that clothing made by small clothing companies such as Lundquist’s are generally better made with better sewing techniques such as smaller and stronger lines of stitching, perfectly straight seams, non-rolling hems and with longer lasting fabrics. The pieces are made to last the test of time—not just to last until the next fashion season. Lundquist is aware that in the throwaway culture we live in it’s a difficult thing to purpose to create a wardrobe that will serve us for a long while. “It’s hard to know where to start when creating a wardrobe, but I think people should start with one good piece, and build a wardrobe around that,” she says. Building a wardrobe can be a difficult task for most women, so Lundquist will even help her clients with custom fitted designs from her collection. “Besides designing pieces to be sold in stores I also want to do a lot of individual work from my line—helping women to design a wardrobe that works for them and them alone,” she says. Lundquist knows that there will always be a fashion industry where consumers will want to pay the lowest price for great fashion. However, she also feels that most consumers, if adequately educated, would not want the hands that make their clothing to be hands that suffer. As a result, it is necessary for consumers to put pressure on companies to create jobs that are safe, secure and adequately regulated and that provide a decent living wage. In addition, we can make our existing wardrobe last longer when we learn proper mending and laundering techniques. We can learn to sew our own clothing and we can buy vintage clothing. Most importantly, we can learn to shop with more intention at local stores that sell articles made by small scale designers such as Lundquist. So instead of a closet full of ill-fitting and unsuitable clothing, I could have a smaller wardrobe of clothing that suits me, fits well, doesn’t hurt the person who created it or the environment. Who knows, I’d probably spend less overall on my wardrobe and I’d look and feel amazing. It would require a shift in how I think and purchase clothing, but it’s not an impossible goal.